Just for fun I thought I’d share a few interesting geometric theorems that I came across recently. In 1899 Frank Morley, a professor at Haverford, discovered the following remarkable theorem. I’ve made a Geogebra applet illustrating this theorem. You can find several proofs of Morley’s miracle at this website. When he was sixteen years old Blaise Pascal discovered the following theorem. If any hexagon (convex or not) is inscribed in a conic section and opposite sides are extended until they meet, then the three points of intersection will be collinear. The line is now called the Pascal line. I’ve made a Geogebra applet illustrating the Pascal line in the case where the conic section is a circle. When you try the applet, do not forget to try the nonconvex configurations! In fact, given a hexagon, we could keep the vertices fixed and permute their order to obtain other hexagons. A little combinatorics shows that there are 60 different hexagons for each collection of six points. Each configuration has its own Pascal line. There is a lot known about these Pascal lines and their intersections. This last theorem is remarkable, not for what it says, but because of the difficulty of the proof. In 1840 C. L. Lehmus asked for a purely geometric proof of the following elementary-looking theorem. Any triangle with two angle bisectors of equal lengths is isosceles. 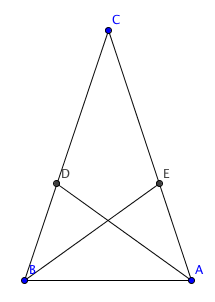 For example, suppose we have the triangle shown below with angle bisectors and of the same length. Prove that and are the same length. Thanks, Jason! I meant to add a link to your applet, but forgot.